Jumping Salad, Fresh Water Shrimp Salad. 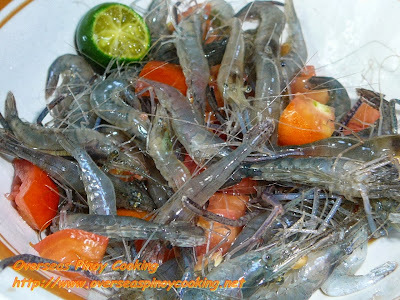 Live shrimp are eaten alive and literally still jumping with only a dip or drizzled with kalamansi and salt to taste. This kinilaw version of shrimp is very popular in Ilocandia and some other part in the Philippines. 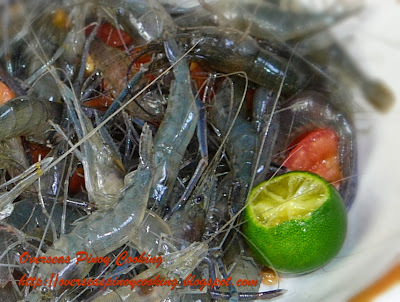 The small live fresh water shrimps are eaten live including the shell and some eat also the heads. There are no exact quantities for this recipe, ingredients deepens on ones preference. Wash fresh water shrimp and drain. Put fresh water shrimp in a deep bowl. Toss in all other ingredients in the bowl. Quantity of as per ones taste and preference. cove bowl to prevent shrimp from jumping all over the place. Serve immediately while the shrimp are still alive. i feel bad for the shirmps eaten alive..
Kabadtrip yung mga ipokritong "i feel bad for the shrimps" jan. Ipokrito parehas din pag kumain ka ng patay o buhay.